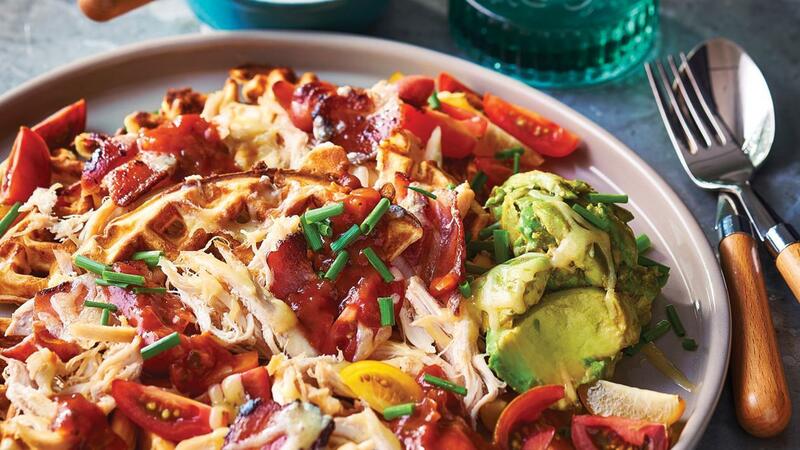 Re-invent your nachos with this American inspired twist. Potato, buckwheat waffles, bacon, roast chicken and avocado topped with Mexican sauce. Bring the water to the boil and whisk in the KNORR Instant Mashed Potato Mix, add remaining waffle ingredients to form a smooth batter. Cook in a waffle iron. Stack waffles on a plate, add bacon, chicken, cheese and avocado, then pour over KNORR Mexican Chunky Salsa Mild GF.